2016 Legislative Summary - Week 4! Home > News > 2016 Legislative Summary - Week 4! 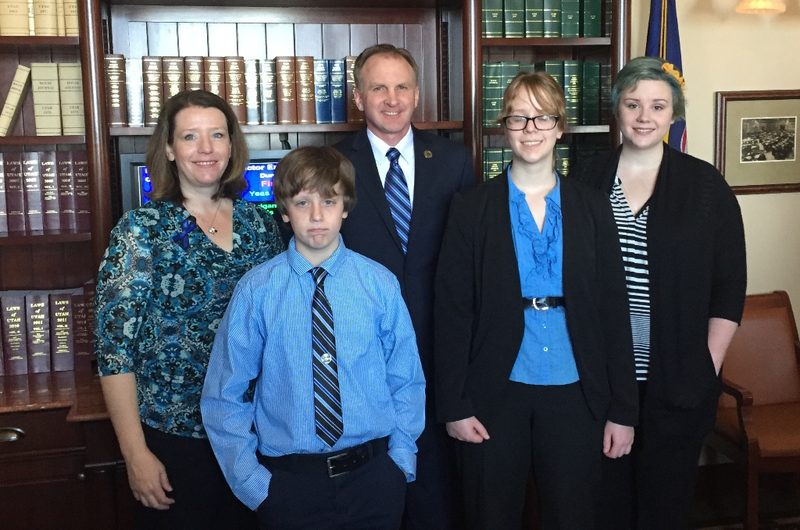 The wife and family of Officer Doug Barney visited the Capitol this week. Officer Barney, a West Valley resident, died in the line of duty in January. They were honored by the Utah House and the Senate. Condolences to their family and thank you for your sacrifice. RIP Officer Barney. 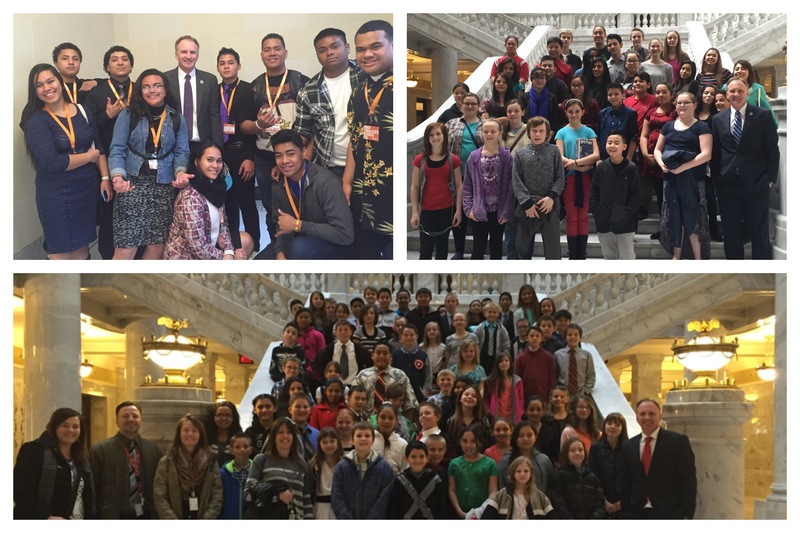 Local Students Visit the Capitol! This last week we had student from Granger High School, West Lake Junior, and Robert Frost Elementary visit the Capitol building this week. They were great groups and had fantastic questions. Thanks for visiting! HB83 - Campaign Finance Disclosures in Municipal Elections - I am the chief sponsor of this bill. Passed the House with a vote of 64 - 5. Passed a Senate committee 3 - 0. It now heads to the full Senate for a vote. Currently, justice court judges need not be law school graduates. In fact, the only education requirement is a high school diploma. I want to change that. HB89 - Office of State Debt Collection Reporting Amendments - PASSED! - I am the chief sponsor of this bill. Passed the House unanimously 73 - 0. Passed the senate 25 - 0. There are hundreds of reports in state code required to be presented to the legislature every year. Some are more vital than others. Some are not really needed. During the Interim, our Infrastructure and General Government Appropriations Subcommittee identified one report that should be done away with. It's not a hugely important bill, but it deletes a section of our too-large State Code (which is always a good thing). There has been some debate over how to select state school board members. Last year, the previous process of the Governor selecting two candidates and putting them on the general election ballot was held unconstitutional by a federal court. So as it stand now, anyone who wants to be a state school board member will be on the ballot. There is currently no mechanism in state code for a primary. All this bill does is add a primary election, so there won't be more than two candidates on the general election ballot. This bill also makes some minor revisions to what county clerks can do, administratively, with "inactive voters." This will direct the Department of Public Safety to conduct a study regarding the possibility of allowing Utah drivers the option of having their driver license on their mobile phone. Although some drivers will certainly prefer to keep carrying the plastic card, we as a State need to acknowledge there is a desire by many drivers to have this electronic option. At this point, the bill only requires a study, which will educate us more regarding the possible options, and the challenges that we need to overcome if this were to become a reality. Other states are looking into this possibility, and we can learn from their efforts as well. HB263 - Fraud Amendments - I am the chief sponsor of this bill. Passed the House 73 - 0. Awaiting action in the Senate. This is an important change requested by the Utah Attorney General's Office. There is a plague of false identification documents throughout Utah (mostly false driver licenses and false social security cards). Right now, it is illegal to "transfer" a false identification document. However, unless law enforcement can prove that the document was actually "transferred," there can be no prosecution. Accordingly, this bill would also make it illegal to "possess with the intent to transfer" a false identification document. This is similar language that is found in the Controlled Substance Act. This bill will help track down, and prosecute, those in the business of forging and distributing false identification documents (which unfortunately, disproportionately affects children). I have held two Town Hall meetings over the last few weeks. Thanks to those who attended and asked great questions. I have one more Town Hall meetings scheduled during the legislative session. All of the following Town Hall meetings will be at West Valley Library (2800 West 3650 South). I have mailed a survey to constituents within District 33. The answers you provide to these survey questions are invaluable. Please, please, please fill it out and return! I am very interested in your perspectives. Your comments and thoughts are greatly appreciated. You can also take the survey online athttps://www.surveymonkey.com/r/RepHall2016 if you prefer that method. Thank you so much! I make a concerted effort to reach out to all of my constituents. For that reason, I use as many different forms of communication as possible. Most of you have received mail from me. I also have frequent town hall meetings (more on that above). You can follow me online at www.votecraighall.com. For even more frequent updates, you can follow me on Facebook at www.facebook.com/votecraighall and/or on Twitter atwww.twitter.com/hcraighall. You are also welcome to call my cell phone anytime. (801) 573-1774. I will be in many meetings throughout the legislative session, so if I don't answer right away, feel free to leave me a message and I'll try to call back as soon as possible. I will also be sending out regular updates via email. Probably the quickest way to get ahold of me is by email. My legislative email address is chall@le.utah.gov.